At the recent Epic Gathering, I did a bunch of ski demoing and thought I'd share the experience. Day 1 - I had access to the Philpug quiver, as, I was his house-guest. Northstar ski area had some very eastern hard snow conditions, so naturally, my first demo was a Blizzard Bonifide, and 100 waist ski designed for soft snow. go figure! OK, we thought it was going to warm up, never happened. On some refrozen snow, it did much better getting on edge than I would have predicted. Light and almost nimble for a wide ski. I can sense why this ski gets some fine reviews. In the pm, I swapped skis with a friend who owned Hart Pulse skis ( 78 waist, 170 cm ). Very quickly, I was back in my skinny ski comfort zone on hard snow. Very fast edge changes, great holding power, stable. I owned these skis a few years ago (in a 178) and sold them to Helluvaskier, always wanted to get on them again. Phil commented that my skiing changed for the better. They confirmed my belief that fat skis on hard snow are a waste. My friend is considering selling the Pulse's, he may just have a buyer. Day 2 - I used the skis that Philpug skied the previous day, 2013 Blizzard M Power FS IQ Max (87 mm waist and 174 cm). Snow conditions remained the same as day one, only more slick areas. Phil just laid GS tracks all over the mountain with them, but, no magic in them for me. A high end ski in the Blizzard carver series. Perhaps too stiff for me to bend, edges could have benefited from a re-tune. Fine in snow where I could get grip and speed. At day's end, my friend and I swapped for a few runs and I was on his Kastle MX 88's. Very quickly he wanted his skis back, and, I wanted to keep the Kastle's. A quick observation from day 2. I was on snow conditions that I experience all the time, my Gathering friends were on much harder snow than they are accustomed to skiing. It was gratifying to see them struggle that day, and, I would eat those thoughts as they skied me into the ground on powder later in the week. Day 3 - Alpine Meadows and it was snowing big time all day long. For the first time on this trip, got on my Dynastar Sultan 94's. Visibility was an issue, and there was a fair amount of new snow over boilerplate, so it was a learning experience. In knee high snow, they just went everywhere very easily. They punch through snow, and, well deserve the reputation for good crud skis. I do miss the quick edge changes. Day 4 - Mt.Rose Demo Day - Philpug arranged for 6 companies to do a private demo for the Epic folks. God bless him. There was a new snow from an all night storm, and, in hindsight, I should have just skied more and demo'd less, but, here's the list and some very quick comments. Elan Waveflex 14 - Considering this for a hard snow quiver change, snow was just too good to spend time on a narrower carver. Fast edge to edge, stable, Nice ski. Elan Chainsaw - 115 waist powder ski. I don't understand skis this wide and the powder was getting chopped up. One run and done. Rossi 88 - One run and done. In retrospect, I had no enthusiasm when I took the ski out, the Rossi I wanted was out. Dynastar Cham 97 - The first ski that I did not want to return to the demo area. Light, playful well matched to the conditions that day. 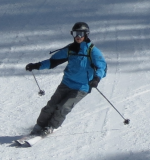 Wide tip, narrow tail, not all like the ski but for a newbie in Sierra snow, it worked for me. Kastle LX 82 - Made me smile, big time. Took it into powdery bump runs and my friends quickly commented that my skiing just improved so much. Again, I know this ski width and it just matches what I do on a regular basis. Would be my soft snow everyday ski if I were in Tahoe. I know Gary has an low 80 Kastle for his soft snow ski, now I know the fun he experiences. Dynastar Course TI - 72 mm, 170 - This is a serious contender for my Supershape replacement, so, in the afternoon, I took it for an extended demo. A nice, short radius carver, but, my friends were doing GS skiing. Fast edge to edge, stable, no hard snow, so, not a great test for my daily skiing. In 4 days, I've been on 11 skis. I'm confused. Day 5 - White Wedding Day at Northstar, and, back on the Sultan 94's. I am beginning to understand Sierra powder. Right ski for the conditions, I'm happy. Day 6 - Squaw with John Botti and High Angles. Skiing the deepest snow that I've ever experienced plus a little heavy, and, struggling on the Sultan 94's. That day, only High Angles had the right skis. Technique flaws show up big time. One of my ski poles is buried in a snow and will not surface for a few months. If you ski the Sierra's following a dump, get a real wide ski. Day 7 - Back to Mt. Rose, and, the Dynastar rep, who married Phil and Snow Hot, is there and lends me the Cham 107 for the day. My first runs are a struggle due to tired legs, but, it comes back and the 107's are great in chopped up powder and mild bumps. My technique is in shambles, they helped me get through. Very much lighter and more nimble than the Sultans, but, don't get through heavier snow as easily as the Sultans. Trade offs are a way of life. My apologies for this long, rambling post. None of the above is to be considered an in-depth review, just a snapshot. While it was fun being on so many skis, for me, it's always been more about the archer than the arrow, the week confirmed it. It also confirmed my love for narrower carvers, if, for nothing else than lack of knee pain. Well done!! I really enjoyed the narrative, snapshot approach. Sort of "here's how my week went and some different skis were part of it". Considering this is your first experience with "Sierra Powder", which should not be confused with Utah Powder or Colorado Powder, you did quite well. It was truly nice skiing with you. Hey Mike, no need to apologize. It was fun to read your quick snapshot reviews. So.....are you keeping the Sultans? Liking those, are you? Too bad you couldn't have tried the Waveflex 14 and Course Ti on the hard snow day. I've read great things about both skis, esp. the latter. That one may be an eventual replacement for my Progressor 9's. Supposed to be superb, smooth and powerful, yet not overly demanding. I really like Dynastar skis. Sounds like you had a great time out there. And I hear you about getting more time in powder. I experienced some of that at the back bowls of Louise last week -- steep pitch, 12 to 18 inches of fresh snow pushed around into big crud piles; first I was a flailing beginner; then began to approach some semblance of balance and poise. Could have used wider skis, but doing this on my Mythics at 88mm was a great learning experience in two-footed skiing and gentle transitions. Tons of fun, nevertheless. Give me more!!! I'm not bummed that he didn't have hard snow to ski while doing this test.